Register to receive in-office support materials, patient savings information, and free samples of Welchol. Help Appropriate Patients Meet the Challenge. What are you adding to your statin to help meet the challenge? Welchol is the only statin add-on that can reduce elevated LDL-C and improve glycemic control—that's the Welchol difference. The photos depict models, not actual patients or healthcare professionals. Welchol may provide benefits for adult patients with primary hyperlipidemia, type 2 diabetes, or both. Offer your patients 2 different dosing formulations. Choose from Welchol tablets or Welchol for oral suspension. Based on a $0 co-pay for a 90-day supply or a $10 co-pay for a 30-day supply. Restrictions apply based on eligibility. See Terms & Conditions below. those with a history of hypertriglyceridemia-induced pancreatitis. Welchol can increase serum TG concentrations particularly when used in combination with pioglitazone, sulfonylureas, or insulin. Caution should be exercised when treating patients with TG levels >300 mg/dL. Caution should also be exercised when treating patients with gastroparesis, gastrointestinal motility disorders, a history of major gastrointestinal tract surgery, and when treating patients with dysphagia and swallowing disorders. Welchol interacts with some drugs. Drugs with a known interaction with colesevelam (cyclosporine, glimepiride, glipizide, glyburide, levothyroxine, olmesartan medoxomil, oral contraceptives [ethinyl estradiol, norethindrone], and metformin extended release [ER]) should be administered at least 4 hours prior to Welchol. Drugs that have not been tested for interaction with colesevelam, especially those with a narrow therapeutic index, should also be administered at least 4 hours prior to Welchol. Alternatively, the physician should monitor drug levels of the co-administered drug. To avoid esophageal distress, Welchol for Oral Suspension should not be taken in its dry form. Due to tablet size, Welchol for Oral Suspension is recommended for, but not limited to, use in the pediatric population as well as in any patient who has difficulty swallowing tablets. Please click here for Full Prescribing Information about Welchol. 1. 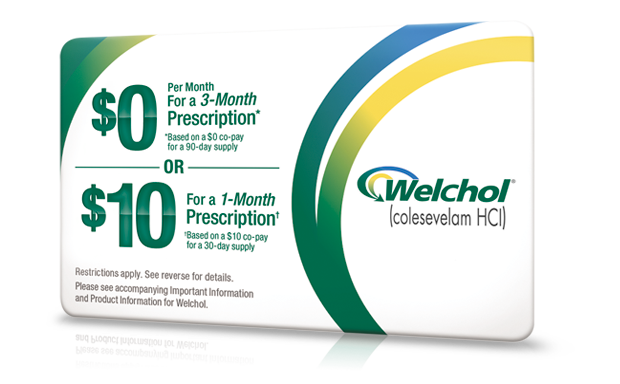 Welchol (colesevelam HCI). Prescribing Information. Daiichi Sankyo, Inc., Basking Ridge, NJ; 2017.